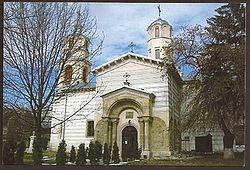 Armenians have had very extensive communities throughout Romania over the centuries, which have done everything from founding a city and getting tax exemptions to building churches all over the place. 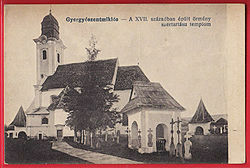 The city of Gherla was founded by Armenians, and originally known as Armenopolis. Zamca Monastery (Mânăstirea Zamca) was founded by Agopsa, son of Amira. Haji Kadar (Hagiqadar), Holy Cross or the Church of the Wishes (Manastirea Dorintelor) of 1522. People would circle this church on their knees in order for god to grant them their wish. St. Simeon - built in 1513 by Donig, also known as the Red Tower. Today the delegation spearheaded by Romanian minister of national defense, Theodore Meleshkanu, has met with the Armenian defense minister, Michael Harutunyan, within the framework of the official three-day visit. In the words of defense ministry press secretary, during the meeting the parties spoke about the current pace of military and military-technical cooperation between the two countries. The defense ministers said all preconditions exist for that cooperation to make deeper, particularly in the field of military education. The officials also spoke about Black Sea regional safety and Karabakh conflict settlement. The Armenian ministry of defense and the Romanian national defense ministry signed the bilateral military cooperation plan 2008 upon the end of the meeting. Romania will not join France and other Western states in officially accepting the massacres of Armenians in Ottoman Turkey as genocide, Romanian President Traian Basescu said on Tuesday. He explained that his country does not want to risk spoiling its relations with Turkey, which strongly denies that the 1915-1918 mass killings and deportations constituted a genocide. Visiting Yerevan last week, Chirac indicated that genocide recognition should be a precondition for Turkey’s membership in the European Union. "Each country grows by acknowledging its dramas and errors of the past,” he said. Basescu argued that Romania laid to rest its historical disputes with neighbors for the sake of membership in NATO and the EU. “Romania is one of the countries which at any moment can have disputes with neighbors regarding the border, history and so on. So is Armenia and so is Turkey,” he said. The Armenian genocide has been officially recognized by the governments and parliaments of about two dozen nations, including France, Italy, Canada and Russia.